iThera Medical offers the only optoacoustic imaging system with real-time whole-body imaging capability. This powerful tool for preclinical small animal imaging introduces a new standard into preclinical research. Biological processes and the effect of pharmacological substances can be observed in vivo, in deep tissue, in real time, and in high resolution. Endogenous chromophores as well as extrinsically administered probes can be differentiated from tissue background by tuning the excitation laser wavelength, collecting the optoacoustic signal acquired at multiple wavelengths and performing spectral unmixing. An animal bed enabling automated 2D and 3D imaging of small animals using a variety of handheld detectors is now available. The animal bed can be used as an adjunct with inVision and EIP MSOT imaging systems. iThera Medical proudly announces the launch of its integrated optoacoustic / ultrasound (OPUS) imaging technology. The MSOT inVision 512-echo is the world's first hybrid tomographic OPUS imaging system, providing unparalelled and user-independent image quality, in real time, throughout the entire animal cross-section. While the tomographic optoacoustic images generated by the inVision systems contain excellent information on tissue morphology based on hemoglobin absorrption, the integration of reflection-mode ultrasound tomography (R-UCT) capability adds complementary anatomical information, particularly for structures that are poorly perfused. The figure below documents the complementary information provided by the MSOT inVision 512-echo from optoacoustic and ultrasound imaging. A: Maximum intensity projections (MIP) of whole-body optoacoustic (left) and ultrasound (right) images stacks. 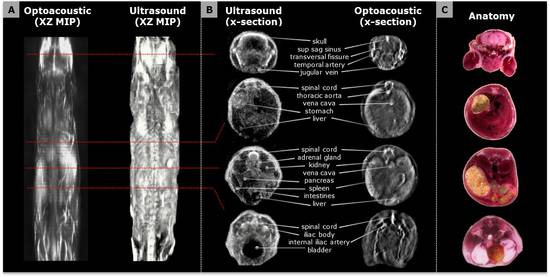 B: Annotated cross-sections of optoacoustic (right) and ultrasound (left) images. C: Reference histology for OA / R-UCT cross-sections shown in B. 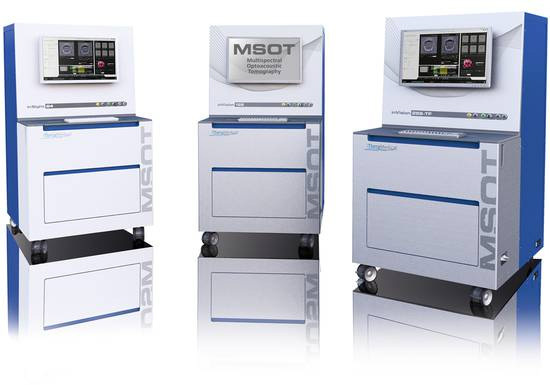 All MSOT inSight / inVision imaging systems are designed to be fully upgradeable. 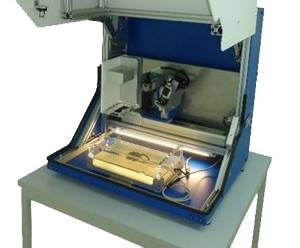 Integration of R-UCT requires the use of a 512-element detector, the integration of transmit / receive electronics and adaptation of the acquisition and post-processing software ViewMSOT. A brief information pack on our new OPUS technology can be downloaded in the respective section on the right or under Link.